After last winter’s seemingly never-ending wickedly cold weather, residents in much of the country can expect more of the same in the coming months. 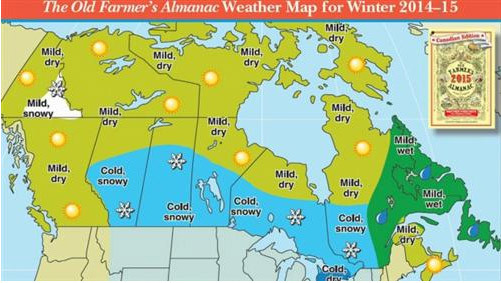 “We’re looking at the T-Rex of winters,” Jack Burnett, editor of the Old Farmer’s Almanac, said on CTV’s Canada AM on Thursday. According to the almanac, central Canada, in particular, is expected to experience winter’s nasty bite. “From Calgary to Quebec, we’re going to be up to our neck,” Burnett said. One of the few exceptions will be southwestern Ontario, which will be cold, but with below-normal snowfall. Atlantic Canada, meanwhile, is set for a milder, but wet winter season, according to the almanac. It may seem far in the future, but warmer temperatures will return – eventually. Summer in Canada is expected to be milder and wet, with hotter and drier temperatures concentrated in Western Canada. “Nothing really spectacular in the summer,” Burnett said. The Almanac has been foretelling weather forecasts for 223 years, and claim their predictions have an average accuracy rating of approximately 80 per cent. The predictions are derived from a secret formula devised in 1792 by the almanac’s founder, Robert B. Thomas. “We do have the physical formula, but it’s long since been put into computer algorithms,” Burnett said. The almanac employs meteorology, climatology, solar patterns, and historical weather conditions to make its predictions. Dave Phillips of Environment Canada doesn’t quite buy the almanac’s prediction, though. Phillips said Environment Canada’s forecasts aren’t always right, but that their predictions are more realistic than the almanac. Canada may be set for a drop in the mercury, but average global temperatures spiked during the summer months. U.S. meteorologists said Thursday that May, June and August all set global records this year. The average worldwide temperature was more than 16 C in August, which broke a record set in 1998. August was particularly hot in the Pacific and Indian oceans, and in Africa. Phillips said the warm ocean temperatures generally mean a milder winter, and he thinks that will especially be the case in Western Canada this year. Though he said conditions become more difficult to predict as winter wears on, Phillips had no doubt about one thing.